One of my favorite activities as a school consultant is setting up classrooms. Sometimes I set up new classrooms that didn't exist. Sometimes we reset classrooms that are having difficulty. We have a training model we refer to as the Demonstration Classroom. In the demo class, we go in, set up a classroom to meet the individual needs of the students, run the classroom and then coach the staff to follow the schedule, provide instruction, use the visuals etc. It's an intensive week-long training and we set up the classroom itself in 3 days. It's exhausting but I love it. And because I've done so many demo classrooms over the years, I've gotten pretty good at prepping what most special education classrooms will need to be successful. I've also developed several systems we use to set up classrooms efficiently. I have talked about the systems I use to set up the classroom in the series of posts of 10 Steps to a ​Well Run Classroom. Today I want to talk about what you need to prep your classroom and get started off with the materials you need. My co-worker and co-author Susan Kabot always says that you can't do your job effectively if you don't have the right tools. Much of the prep work for setting up a classroom involves making sure you have the tools you need to do the job. 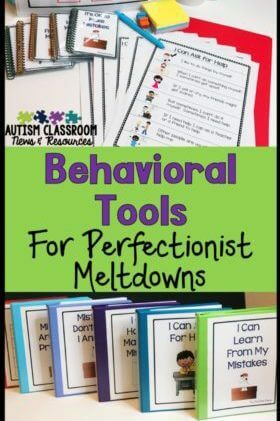 So, let me share some of the essentials I see for a classroom supporting students with autism and many other disabilities. You can read in more detail about what visual supports classes need to start the year in this post. Click the picture below to check it out. For those who might have read it before, I've updated it! It covers all the visuals described in #1 above. Starting the year off, it's really important to establish a good working relationship with the families of your students. A good first impression, in this situation, goes a long way if things get tough during the year. A good home-school communication system can really help build this relationship. Many of our families have difficulty knowing what their students do during the day at school. Their students are nonverbal or minimally verbal and aren't able to tell them about their day. In addition, you will be busy throughout the day and finding time to write a long note home each day is difficult. For years, I've used these check-off systems (with comments) to send home with students. You can even email them so you have a copy to keep. We used to have to run them through the copier each day. Click﻿ ﻿the picture to see notes for all ages in my store. You can have students complete them, you can complete them or paraprofessionals can complete them and you check them. You can add a comment and off it goes. 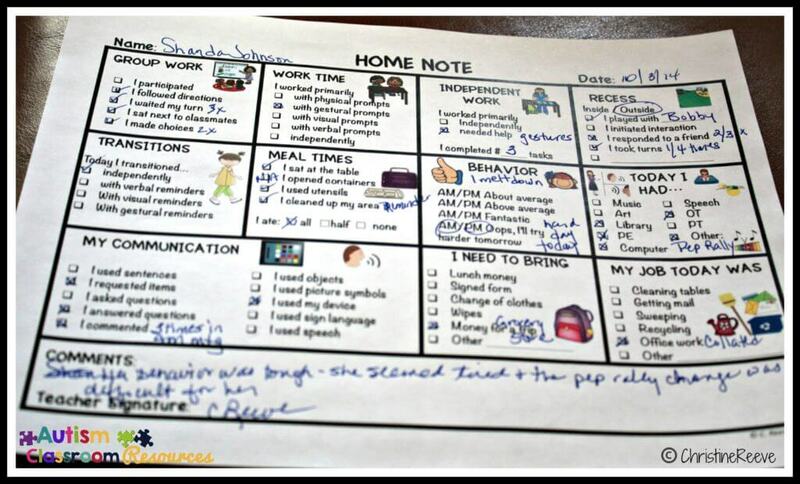 The parents now know HOW their child did (positive and negative) at school today, not just what he did.​ You can read more about effective home-school communication in this post. I've written A LOT about these in the past, but to get a basic understanding of them, check out this post about structured work systems. I feel that independent work systems are a given to all students with disabilities, with or without autism. All of our students need to learn how to work on their own. This post on Setting Up Independent Work Systems will give you an idea of how they are setup. The Structured Work System Starter Kits are designed to give you everything you need to get an independent work system (TEACCH) up and running in your classroom quickly. Click the links below for more information. 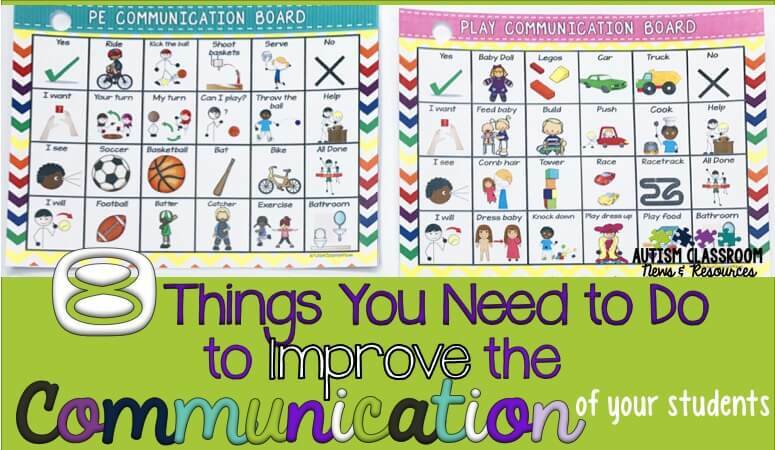 Communication systems are a must if your students are working on any type of language and communication skills. Some students will come with their own systems. Other students will have the system outlined in the IEP. 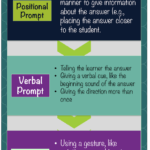 The boards I talk about in the post above are my go-to communication system for classroom set up. They fill in the gaps of students' individual systems, And they make sure I have communication where I need them. 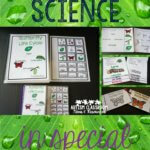 You can read about them by clicking on the picture above, or check them out in my store here: Special Education Classroom Communication Boards. Our students typically need to learn to learn in groups. I often have a morning and afternoon meeting to review the activities of the day. I also can work on communication and language skills as well as calendar skills. Typically we add in some literacy and social skills as well. To facilitate those group activities requires visuals to support our students. Visuals need to be age-appropriate and facilitate the skills we want to teach. So I developed Morning Meeting Starter Kits younger and older students. You have to have a curriculum to follow for your students. Your students have IEPs and many if not all of them may be on alternate standards. However, you still need curricula to move through a scope and sequence. If your school hasn't given or assigned you one, check out the posts below for ideas about which to advocate for. What Is a Curriculum and Why Do I Need One in Special Education? 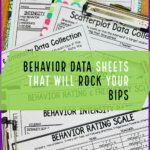 In addition to the behavioral visuals, you need structures in your room for supporting appropriate, positive behavior. To do this, you might have social stories about classroom procedures like this one. Rules are another good structure to have in the classroom. I like to make them as visual as possible. You can download the ones to the left FREE! There are also classroom rules included in my﻿ ﻿﻿﻿﻿﻿visual schedule bundles. Token boards are another way to build reinforcement into the day during instruction or for following the rules throughout the day. Will there be more things you need for your classroom? Of course. You'll need lots of tasks for the students to work on--for ideas you can check out my Workbasket Wednesday tasks. You can check out my store for more ideas and products to work on specific skills. Clearly you would need data sheets and other things. But these 7 categories will get you off to a strong start to be able to add those other things in. But without completely knowing your students, these are the basic structures I recommend setting up in the classroom. If you are are looking for a complete supply list, check out our book on Setting Up Classroom Spaces that include supply lists for younger and older classroom. (That's an affiliate link). If you have any questions, feel free to leave me a comment and I'll do the best I can to help. Don't let the start of the year overwhelm you. Just take it one step at a time and you will get it going.